Ireland captain Brian O'Driscoll expects Australia to get the better of the All Blacks when the two sides meet in the Tri-Nations next week. 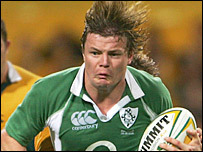 O'Driscoll led the Irish in defeats to both teams this month but was less impressed by New Zealand. "You have to match New Zealand with muscle power, which the Aussies can, and I'm sure they will be out to turn over the All Blacks," he said. "Added to that, the Aussie backline are probably smarter than New Zealand's." Ireland ended their tour of the southern hemisphere on Saturday with a 37-15 defeat to Australia on the back of 34-23 and 27-17 losses to the All Blacks. O'Driscoll added of the Wallabies: "They tend to read the game extremely well and they work out early where they think they might exploit your frailties." New Zealand host Australia on Saturday 8 July - the first of three matches between the two teams.